One of the oldest, most direct, and simplest of spell workings would be a Spell Candle. The idea is that the spirit of a candle, when lit, delivers via its flame an assembled collage of other spiritual qualities that you have impregnated the candle with when dressing it. There is a direct relationship between the spirit at the root of a thing, person, or situation, and the manifest expression of that spirit in the world of matter. To shift the vibrational quality of a spirit is to bring about a change in the expression of that thing in reality. And to shift the vibrational quality of a spirit is to press upon it with other deliberate qualities that change the circumstance of its being. To do this, you build a composite spirit by assembling herbs, colors, shapes, objects, and what have you, into a unified identity that is your fixed candle. In the process of fixing you also tie in the candle to your intended subject and whatever change in circumstance you are working for. Pay attention not to usurp the free will of others not consenting to this magical spell work. The spirit of the candle starts with its color or colors, for each color holds different vibrational spirit qualities. Adding to this you may carve names, significant numbers, and magical or spiritual symbols upon the candle, further shifting the vibrational identity of the candle to better serve your intended goal. You can also use oils, herbs and other added elements that hold significant qualities in the fixing of your candle. To finish this process of setting the candle, you expel your spirit’s breath, your wind of creation, upon the surface of the candle, charging it further to its task. Then you may light it in an appropriate place and time to set the spell in motion. Once a candle is lit, it must never be blown out. Some feel it is okay to snuff a candle, leaving it hungry to rekindle and continue its work at a future time. Others would insist that once started, you should never stop the process, allowing the candle to burn out itself in what time it needs to complete the work. Those who prefer to let a candle burn through often it them in some kind of fireproof container so they can safely leave the candle unattended. There are many elements that can be employed in the fixing of a candle, which further evolves this art into a potent and complex spell crafting system. To learn more, seek out classes or start with a candle magic book or two. 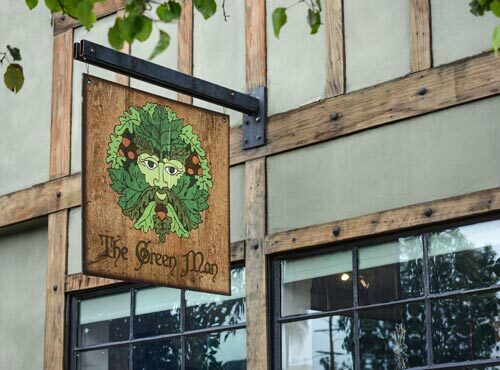 At The Green Man we have a large selection of appropriate oils, herbs, and other materials used in the fixing of candles, plus a wide selection of in-house magically poured candles in many colors and combinations of colors. We also stock figure candles of many sorts. Often even people who are able to fix spells for themselves seek out a practitioner to fix a spell for them, as it can sometimes be more potent and clear when wielded by a person outside of the situation that is being adjusted by magic. For those who would rather have someone fix a candle for them instead of fixing one for themselves, we offer a full range of candle fixing services. However, we refrain from using candle magic to usurp the liberty and free will of anyone other than the client themselves, keeping the magic clean, pure and potent!